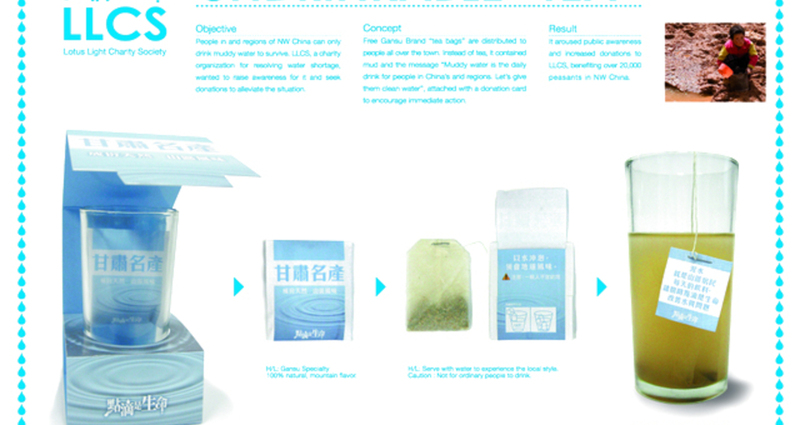 Tea Bag / LCCS (HK) Ltd.
Free Gansu Brand “tea bags” were distributed to people all over town. But instead of tea, the bags contained mud and a message “Muddy water is the daily drink for people in China’s arid regions. Let’s give them clean water”, there was also a donation card to encourage people to give money immediately. People in the arid regions of NW China have no choice but to drink muddy water to survive. LLCS, is a charity organization dedicated to resolving water shortage problems. They wanted to raise awareness of the plight of people in China's arid regions and seek donations to alleviate their situation. The “tea" in the bags was actually dried mud. But Hong Kong’s weather is very humid, so we needed to dry the mud before putting it into the bags. This was the biggest challenge. © 2018 The One Club for Creativity. You are about to delete the record, this procedure is irreversible. Do you want to proceed?